National immigration reform is on the agenda in Washington DC. If passed, reform will likely include tighter border security and a path to citizenship for immigrants who entered the country illegally. Reform was constructed and will be hashed out by congressmen, lobbyists and other breeds of politicians. But, as the bill slowly progresses through the tricky machine of DC, youth are grabbing the national spotlight. One in five children in the US are immigrants or the children of immigrants. Immigration reform or the absence of it has a lasting impact on these kids’ families, homes and future. As the topic heats up in Washington, youth are making their voices heard from Chicago to Los Angeles to San Diego. Youth-led immigrant organizations, comprised of undocumented youth or Dreamers, and allies, have discovered they can impact the discussion through simply telling their story. (Loudly, of course.) Even their adversaries admit to these groups’ role in the changing national perspective on amnesty or a path to citizenship for immigrants who entered the country illegally. “They have framed their story in a very popular way, and they’ve leveraged that story very effectively,” Roy S. Beck, executive director of NumbersUSA, a leading group opposing amnesty, told the New York Times. Supporters admire the Dreamers’ courage. “They put at risk their own safety and being sent back to a country they haven’t seen since they were in diapers,” Angela Kelley told the New York Times, an advocate and veteran of many immigration wars on Capitol Hill. As of 2008, over 612,000 undocumented youths or Dreamers have earned high school diplomas or GEDs in the US. Youth first became a powerful player in modern immigration reform during the debate of The Dream Act, or the Development, Relief, Education of Alien Minor Act, in the mid and later 2000’s. The Dream Act legislation offered undocumented immigrants brought to the US as children a 6-year path to citizenship, which required college enrollment or two years of military service in the US army. 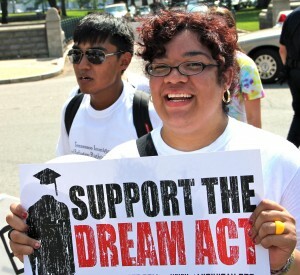 The Youth movements’ vocal support of the Dream Act was key in pushing the legislation to congress in 2010. Though it was eventually defeated, the Dream Act caught the nation’s attention and was crucial in paving the path to the current legislative debate. Youth movements are often seen as insignificant or more symbolic than fruitful. Youth leaders battled hard to have their voices heard during The Dream Act’s debate. “It was hard to fight for a position at the table because people tend to look at youth and not think they have a valid perspective, or a valid voice, or a valid story to share. And so I think we’ve proven otherwise,” said Sofia Campos, board chair of United We Dream, the largest network of youth-led immigrant rights organizations around the country, to Alternet in March. In an age of social media and internet globalization, youth’s technology skills helped amiplify their stance on the Dream Act. “New technology really encourages youth to mobilize quickly and so youth are able to turn out to places a lot faster than grown-ups,” Ana Perez of the Center American Resource Center in San Francisco told whatkidscando.org. Youth also have the added benefit of sympathy. Many Americans find it easy to root for immigrant kids. They are seen as young underdogs, enrolled in school or serving in the US army, and fighting to stay in the country they have always called home. This is easier said then done, but the organization is supported by millions of other Dreamers. United We Dream connects the 52 most active youth-led immigrant reform organizations. In December, more than 600 youth immigrant leaders (most still without legal status) from 30 states gathered to discuss strategy to impact the current legislative battle in Kansas City, Missouri. These organizations’ tactics range from peaceful protests and sit ins, to door knocking campaigns to mobilize voters on immigration issues, to just telling their story. “Coming out” events, where undocumented youth publicly proclaim their status, have become a common and powerful technique. Dreamers are fast becoming the face of the country’s need for comprehensive immigration reform. Youth movements throughout the country are pushing for big change. Their push may just tip Washington’s decision.